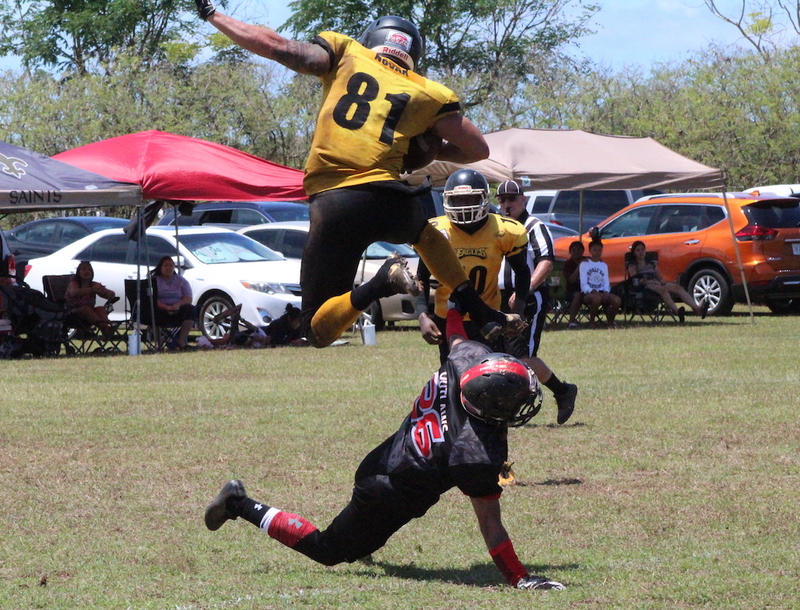 The GVFL playoff games kicked off with two semi final matchups on blazing hot Saturday afternoon at UOG field. The first matchup saw the second seed, the 6 and 2 Eagles, facing off against the third seed, the 4 and 4 Outlaws. The first seed, Raiders, took on the fourth seed, Chiefs. In the first matchup, the Eagles edged out the Outlaws with quarterback, Justin Smith, grabbing a total of 4 touchdowns in a 25-0 victory. The Eagles came out flying as they were able to take the ball on the first drive 80 yards, surviving on 2 consecutive fourth-down conversions, however, the Outlaw defense was able to come up big on defense, forcing a turnover on downs with multiple spots at the 2 yard line. On the next outlaw possession, the eagles defense bring back the momentum on a fumble forced by Teegan Brown recovered by Gavin West to put the eagles in good field position. The Eagles’ offense would capitalize on the good field position with a 26 yard touchdown pass to receiver Isu Mendiola to end the quarter 6-0 after a failed 2-point conversion attempt. “We just wanted to keep things as simple as we could make it. We focused on taking what the defense gave us and make the easy plays. We’re fortunate enough to have the same crew, there’s a sense of being there before. They just wanted to get back in that championship game,” said Smith on their offensive success. The Eagles were able to increase their lead in the second half on a 51 yard pass from Justin Smith to Jon “spicy” Mayo. The passing duo wasn’t done yet, however. Smith was able to find mayo again for a 15 yard pass for a touchdown after a hurdling effort by Keith Novak on a 20 yard pass to put them in the red zone. With the clock running down, the Outlaws would take the ball up on a last ditch effort for a chance to score, but the Eagles’ secondary would deny them a chance with defensive back, Jeff Warfield, grabbing an interception and returning it for about 12 yards before tossing it over to Jerry West on a lateral who took it all the way to the 1 yard line before being taken down by Outlaw quarterback, Daniel Phillips. With the ball at the 1 yard line. Smith would take the snap and drop back only to navigate himself through the out law defense and grabbing himself a touchdown on the ground, his fourth of the day to put the game away 25-0 for an Eagles’ victory. The next contest saw the semi-final matchup between the undefeated first seed, Raiders, and the fourth seed, Chiefs. Hank “The Tank” Sablan helped the Raiders pound their way to victory on a 2 touchdown performance to solidify their spot in the championship on 27-12 victory over the chiefs. The Raiders lived up to their undefeated reputation coming out of the gates hot by scoring on the opening possession with running back Hank “The Tank” Sablan punching in a 13 yard touchdown. However, it wouldn’t take long for the Chiefs to answer back. On the Chiefs’ first possession, they were able to find success in the air on a 35 yard touchdown grab in the corner of the endzone. The chiefs would attempt a 2-point conversion, but failed and ended the first quarter 7-6. Although the Raiders were undermanned in terms of personnel with key players, Storm Rosario and Jesse “pumpy” Manglona not able to suit up, the Raiders were able to be just as dangerous as before. “Our rotation in the backfield is really what allowed us to be successful. Hosea Ware and Dave Delgado fill in really well and our line is the most important thing and they performed well,” said Sablan on the absence of their offensive weapons. Though it seemed like the Chiefs were getting some offensive momentum, the Raiders defense would shut the Chiefs out from finding the endzone again in the half with multiple stops in the backfield, including a big sack by defensive back, Don Kerakes. On offense, Sablan would grab the Raiders another touchdown on a 2 yard punch on the ground to extend the lead to 14-6 at the end of the half. However, the Raiders wouldn’t be done scoring yet. In the third quarter, quarterback, Danny Manibusan, would launch a deep ball to a tightly covered Casey Cruz, who was able to haul in a 30 yard reception to spot the ball within the redzone. The Raiders would score again with fullback, Brandon Burgos, pounding in a touchdown to bring the score to 20-6. “Next week is the championship, and this game was do or die, and we wanted to stay alive. We were all motivated to do what we had to do to ge to the Championships. Everybody executed on defense and did what they had to do and that’s what we gotta to do moving into the championship,” said Burgos on moving onto the championship. The Raiders would get on the board one last time on an 18 yard touchdown reception by veteran receiver, Danny Cepeda to put the game away 27-12 and to send the Raiders to the Championship for a title rematch against the Eagles. Raiders Hank Sablan and Brandon Burgos did tough work on the ground to keep the chains moving for the Raiders. Gavin ‘Agent Zero’ West was big on defense and quarterback Justin Smith played a hand in each score.